The event will also provide a platform for highlighting Heidelberg’s expanding postpress portfolio, and showcase the integration of prepress, press, postpress, and service solutions designed to help customers drive up productivity, drive down waste and open up new business opportunities. In-house finishing in particular will give customers total control over their quality, gaining them time and quality benefits. The new Promatrix 106 FC die cutter with hot-foil embossing and the new Promatrix 106 CSB die cutter with inline blanking as well as the new Diana Easy 115 folder will showcase how maximum process reliability can be achieved at the end of an integrated workflow, in total compatibility with the Push to Stop philosophy. Completed product range – the right machine for every application. Building on the successful introduction of the industrial Promatrix 106 CS and commercially focused Easymatrix 106 CS die cutters, we will soon see three further new products coming from MK Masterwork’s factories in Tianjin, China and Nove Mesto in Slovakia. The new Promatrix 106 CSB die cutter with inline blanking is a new addition to the Promatrix series. The die cutter eliminates the need for costly and wasteful hand-stripping of carton blanks and allows a customer to increase productivity and reduce manufacturing costs. The visual impact of print can be greatly enhanced by the creative use of hot foil. Triggering the “at shelf” buying response is the goal of brand owners, and hot foil is a proven way for printers to meet the brand ambitions of their customers. With highly sophisticated automatic foil control, 20 individually controlled heating zones and the ability to foil in the transverse direction, the new Promatrix 106 FC scores highly when it comes to offering print embellishment. The last of the new offerings is the Diana Easy 115 folder gluer, featuring four- and six-corner box capacity. Designed by the MK Masterwork team in Germany and built in Nove Mesto, the Diana Easy 115 is a new machine but with a heritage that stretches back more than 50 years through many proven Diana models. The Diana Easy 115 features functions from the top-of-the-range Diana X as well as generous throughput up to 350 m/min. The Diana Easy 115 also comes at a very attractive price point for printers looking to replace older machines or develop new products or markets. 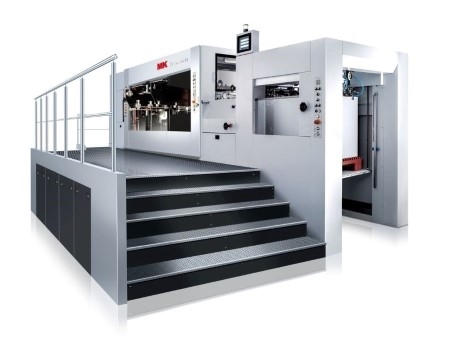 It has only been two years since Heidelberg and MK Masterwork signed a partnership agreement to work together to develop and distribute postpress machines for packaging customers, and yet the results achieved have been outstanding for both companies. Heidelberg has achieved its best sales ever in die cutters over the last 12 months. The long-term success of the partnership is founded on the perfect fit between the two companies’ core strengths. MK Masterwork is the largest manufacturer of die cutters and hot foil machines in the Asian region. As a key player in the Chinese market and the leading supplier to the demanding tobacco industry, MK Masterwork has invested heavily in the manufacturing and R&D capacity needed to meet the demands of customers in the packaging market as well as develop new products that meet Heidelberg’s high standards for operator safety, user friendly operation and production reliability. Heidelberg’s global sales and service infrastructure is the best in the industry and therefore provides a perfect distribution channel for MK Masterwork. Heidelberg has also been able to share with its partner the company’s technical skills gained from decades of experience in the development of print and postpress machines.